Achieving a Shabby Chic room can be done on a budget with the right luxury pieces. A few pricey items mixed with lots of revamped bargain items can go a long way. Shabby Chic is about vintage simplicity, but artistic and comfortable. 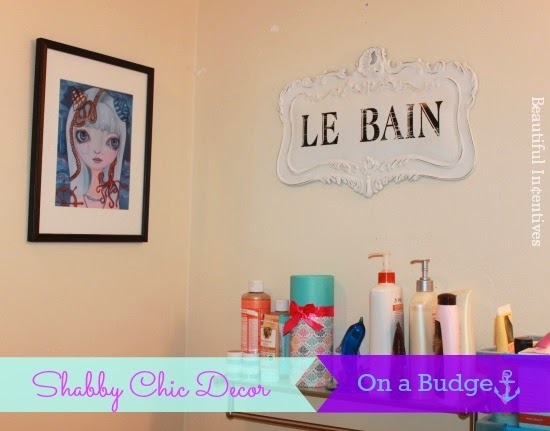 Here are 5 ways to create a Shabby Chic room on a budget. 1. Get a few very artistic and expressive vintage french signs like the one pictured above. That is a shot of my bathroom with accent pieces from World Market, The Dollar Store and Ross. If you are on a really tight budget, this can be done by making your own. You will need a few medium size pieces of wood, white paint, black or grey paint, cursive or other fancy writing stencils and a wood sander to get the distressed look, once the paint is dry. It is relatively simple to make signs, but there are so many beautiful handmade signs you can buy for a good price too. Whichever you prefer, these will be one of the biggest foundations for the Shabby Chic Look. 2. Luxurious White linens, with beige, gray and pink accents or any pastel colors will do. Crisp white linens are the most important part of this look, as most of the room will be made up of White. Try a pretty table runner across your dresser and line up perfume bottles on top. You want to keep it very soft, light and airy. This is where you can spend a little more. It is worth it. 3. Lace and frills. You'll want to have accent pieces with a ton of lace and frills. Think fluffy white throw pillows combined with lace ones, that have french writing. You can stencil this yourself with fabric painting or there are a variety all over that you can buy from places like H&M, Shabby Chic and more. Also, make sure to check Ebay, your local thrift store, TJ Maxx and Ross, for budget friendly choices. Type in Shabby Chic in Google and see all the lovely choices! 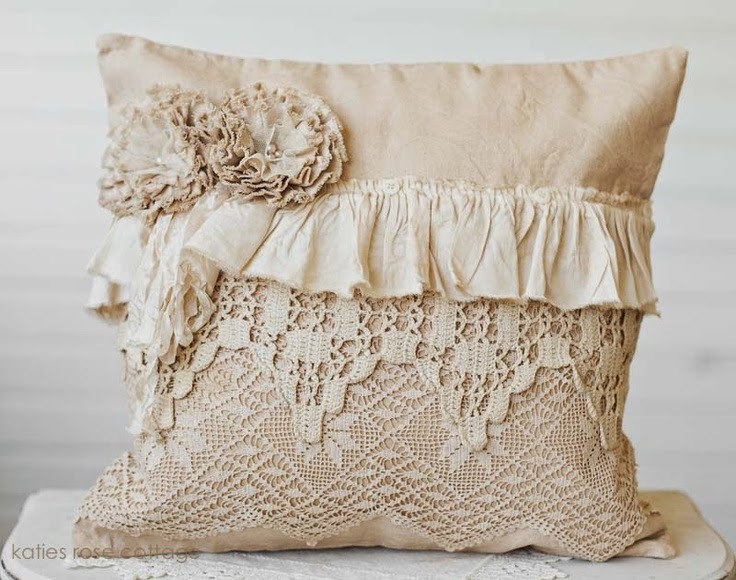 A great way to get the lovingly worn vintage look is to dye old lace pillows in coffee! 4. Lots of pretty storage, stacked up. Think white or pastel painted luggage as night stands. Top them with a sturdy mirror or plexi glass. Find pretty boxes with Floral, striped or polka dotted backgrounds. You wants lots of cute patterns, but in small scales. Get glass or porcelain apothecary bottles and vases in beautiful shapes to go on the dresser or night stands. Fill them with coordinating colored flowers. 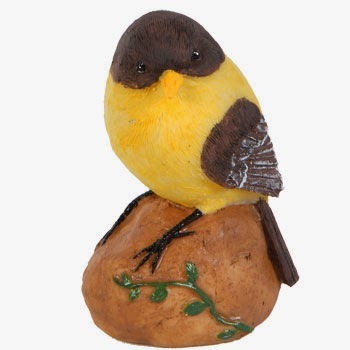 Check the Dollar Tree and Thrift stores for these accents. You'd be amazed at what you can find. It's a treasure hunt and sometimes you will strike gold! 5. Paint as much furniture and accents as you can, in white and pastel colors. Look around for ugly pieces in thrift stores and dollar stores and transform them with paint. If you see an ugly bird or picture frame that has seen better days, it just needs a makeover! You'd be amazed at the things that can be saved with a good coat of paint. You can leave as is or distress it with sand paper or crackle paint you can find at any art supplies store. The Shabby Chic look takes dedication and creativity, but it is fairly easy to achieve. Just keep in mind that we are going for lovingly worn, fluffy, light and airy! You can switch it up when seasons change. During summer, the Shabby Chic by the Sea theme is great. Adorn your place with anchors, seashells and more. Check Pinterest for lots of inspiration! There are so many ideas! Good Luck! 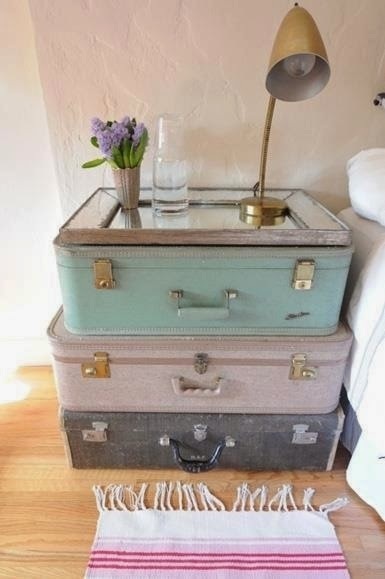 Love the look of the stacked suitcases! It is amazing how a few small details can make a room look so great! The suitcases is a really cute idea. I could see that in my room. i love the ruffles. LOVE ruffles. i would do my house in ruffles if i could. I love the tips! I will be moving so I will have to remember these tips. It will be so fun to decorate! I have a friend who's great about refurbishing old furniture and mixing it with the new stuff in her home!